Among the famous photographs representing the meeting between East and West in China, there is one of a gentleman smoking with a Qing Dynasty official. He looks at the Chinese man in a friendly way as this one gently smiles at the camera. 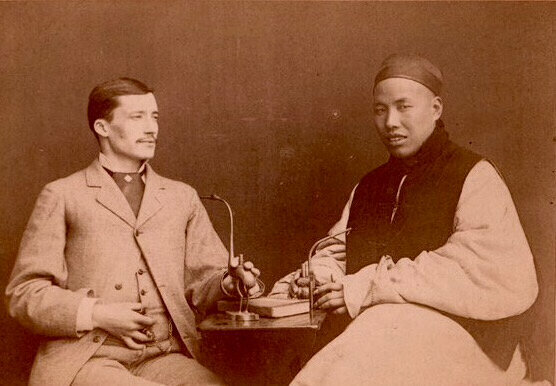 This exceptional picture represents French interpreter Arnorld Vissière with Luo Fenglu, the secretary of Li Hong Zhang, one of the most powerful ministers of the Qing. So when the French Consul transferred an email from Thomas Carpentier, a young man who claimed to be the grand grand nephew of Arnold Vissiere looking for traces of his ancestor, our small group of French Old Shanghai aficionados was more than happy to help. 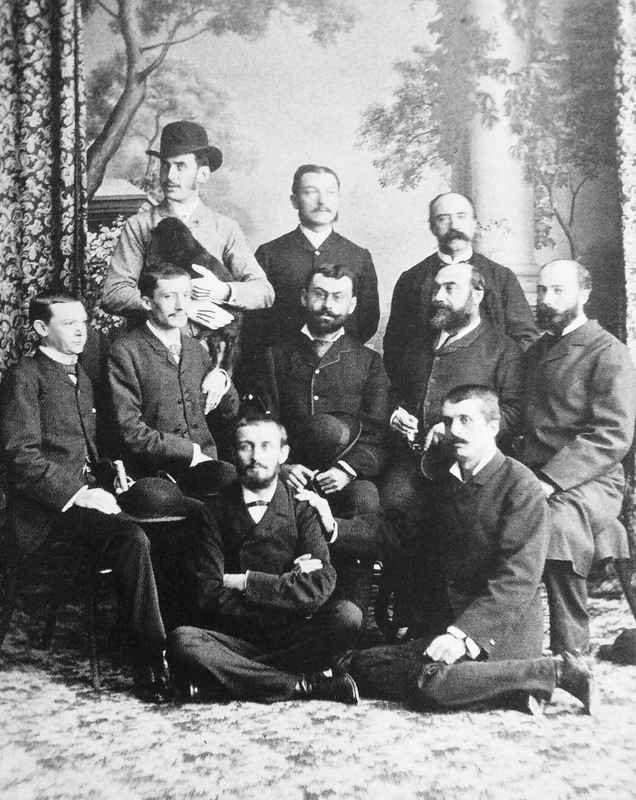 Born in 1858, Arnold Vissière is part of the group of the diplomat-interpreters who accompanied the French presence in China at the end of the nineteenth century. His translating skills were valued so high that the French minister denied him the possibility from returning to France for a long period to make sure he would finish the negotiations of some important peace treaties. The profession of interpreter was not standard when Arnold Vissière started his career. Even if the first Jesuits missionaries had started to codify Mandarin through methods like Wade-Giles or the Ricci dictionary, there was a world between understanding Chinese and been able to negotiate in Chinese, avoiding making Chinese lose face and using diplomatic idioms when meeting important characters. At the difference between his predecessors who often chose the job of interpreter as an easiest way to enter a diplomatic career (some like Kleczkowski did not even speak a single word of Chinese when they applied! ), Arnold Vissière was truly fascinated by Chinese characters, which he started to study by himself at the Le Havre Library. He later graduated from the Ecole Nationale des Langues Orientales. In 1880 he was nominated at the Pekin Brazilian legation as a detached member of the French Foreign Ministry then two years later as an interpreter at the French Beijing legation. Very soon, he was involved in solving conflicts between France and the Chinese Empire. Although the opium war had been won by the British, the presence of Westerners in China was constantly threatened by instability or search for control over former territories including Indochina or Korea. Vissière was directly associated with peace negotiations after the Sino-French 1881-1885 war for Indochina which resulted into the 1885 Tianjin Treaty. On this occasion, he got close to Li Hongzhang, like Chinese Gordon did twenty years earlier. For all these reasons, he made himself indispensable to the French government. Many visitors to China praised his deep knowledge of the language and culture or help into accessing powerful characters. Chinese documents also mention his name as they took him in great esteem. 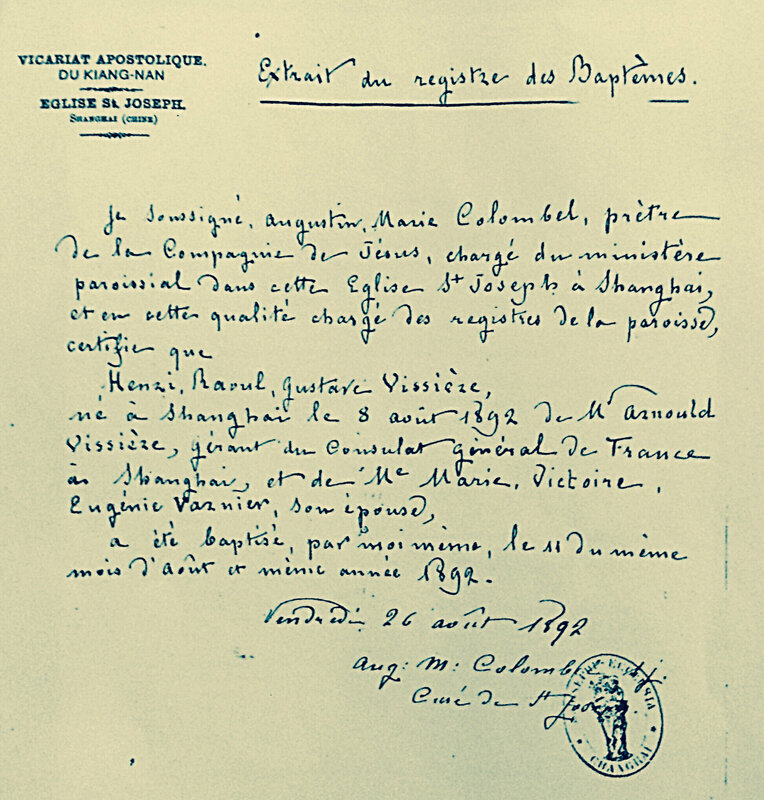 Among the documents shown by Thomas Carpentier during our meeting was the birth certificate of Henri Vissière, the son of Arnold, born in Shanghai in 1892. On this certificate is noted the name of his wife, Marie, which Arnold probably met in France in the late 1880s or early 1890s, finally being able to take a leave after securing the Tianjin treaty. He was at that time administrator of the French Consulate in Shanghai and for this reason probably staying in the neighborhood of the early rue du Consulat, between the Chinese walled city and Yangqingbang Creek, which became later Yan An Elevated Road, near the Quai de France, the Huangpu River French side wharf. In 1899, Arnold Vissière definitely came back to France when the use of highly skilled interpreters was not so important anymore, Chinese diplomatic staff being more and more trained into English or French languages. From then on, he devoted himself to sinology, documenting the edge of the Chinese Empire, one his most famous disciples being French explorer Victor Segalen. Arnold Vissière died in Paris in 1930. 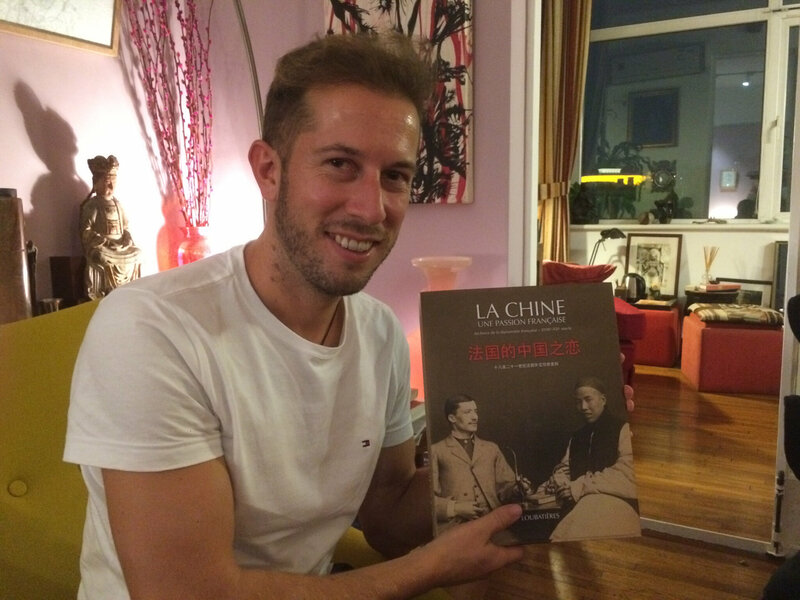 When Thomas visited us, we realized he was a China lover himself, his girlfriend being originary from Sichuan. This is probably a sign of the deep and unconscious connection between his family and China!